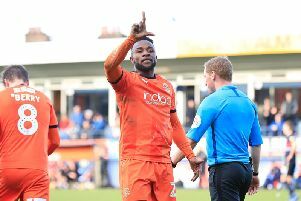 Hatters youngster Arthur Read was understandably elated to score his first senior goal for the club during Tuesday night’s Checkatrade Trophy defeat on penalties to Southend United. With 10 minutes to go, Read, who came through the youth ranks at Kenilworth Road, turning pro in November 2016, rifled home from the edge of the box after Alan Sheehan's free kick was only half cleared. Although naturally disappointed to see Luton pegged back and eventually go out of the competition on penalties, it was still a night for Read to remember, saying: “I wasn’t even thinking, I just thought, 'hit it as hard as I can,' it was a lucky one, but I’m happy it went in. On scoring, Read was mobbed by his team-mates who looked as delighted as him, with the teenager saying: "It just shows our togetherness. "Even if we’re not starting every week, all the players are all together and they’ve welcomed me really well since coming through as a youth player. Moments after scoring his goal, Read then hobbled off with cramp, as he admitted it had been affecting him for a large part of the second half, saying: "I felt cramp in the 60th minute and was thinking just try to get to the 80th minute and see how I feel. "I don’t think I could have gone on much longer, cramp in both calves, horrible, horrible feeling. "To get the minutes under my belt was crucial though as these games are really important. "The pitch was so heavy as well, so towards the end I struggled a bit, but I just had to keep fighting through it. Manage Nathan Jones was impressed with the manner in which Read acquitted himself on the pitch too, in what was his seventh appearance for the club, adding: “He showed real quality. "The boy has quality and I thought he was excellent all night, 19 years of age, to play with the confidence he does and the bravery to get on the ball, I was really delighted for him to to get the goal. "It was good for Arthur to get the goal and we’re very pleased for him. “His performance merited that, I thought he showed real bravery in only his seventh appearance for the club, I thought he had a good night."